"This basic pancake recipe turns into a delicious holiday breakfast simply by adding pumpkin and some fall spices!" I substituted pureed carrots for the pumpkin, and it turned out just wonderful! I tried this recipe today and got rave reviews from some very serious pancake critics in my family. My sons loved them! Excellent for Christmas morning brunch and very light and fluffy! 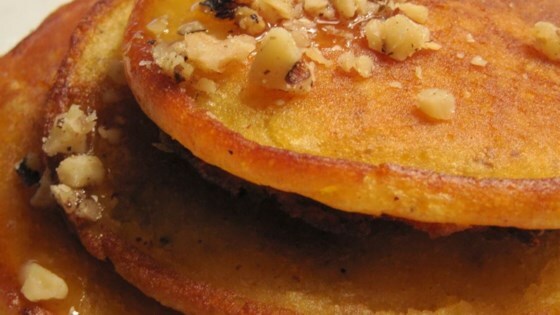 These are fun fall pancakes. I like min a little thinner, so these were a bit too thick for me. Next time I will add more milk. They are very moist.